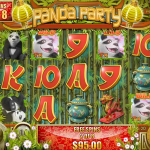 Panda Party is a 5 reel / 2- paylines slot game released in 2015 by Rival. This makes it one of the newer games in this arsenal and although you’d think this game is about Pandas it is more about the Chinese culture. The cool thing here is the option to choose how many paylines will be active so it is really up to you if you want 1 or 20 active paylines. The Wild in this game is the Panda symbol which will substitute other symbol to create a winning combination. There are also two scatters here. The first one is the Free-Spin symbol. Landing 3, 4 or 5 anywhere on the reels will reward you with 1, 5 or 40 Free Spins. The Wild in this game will come with a 5x multiplier. 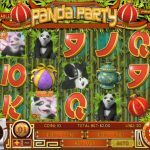 The Pandamonium Bonus can be triggered only once the Free Spins have been re-triggered and the Lucky Lanterns are green. Then the free spins symbols will be replaced with jackpot ones nd the pandas will litterally be falling off the sky to increase your multipliers. 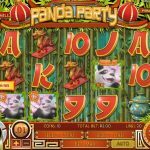 Panda Party is certainly not a typical slot game and this is the main reason why we love it. It is quite difficult to make things different in this type of game and Rival did really well. This game promises very high prizes and certainly delivers. Once you get used to all the different rules and signs we’re sure you’ll love it too. If Africa flows in your veins you should consider playing Wild Safari a 5 reel slot by Rival.